One of my favorite things about life these days is that people really think outside of the box when it comes to careers and making money. When I was in high school, I never would've guessed that I would be where I am today. Just like most high school kids, I thought the next steps were exactly what people said I was supposed to do- go to college and then get a job based on my degree. So I did exactly that. And then half a year out of college I hated my job and had no idea what I wanted to do with my life. I didn't even know how to think outside of the box when it came to my life. It took me a long time to figure this out, but there are so many different ways to make money. Casey and I have been building our business for over 6 years now and have used many methods for making extra money on the side. I even spent a few months driving for Lyft! So let's talk about ways you can earn some extra income and hopefully you can figure out something that works for you. 1. Start a blog. This may seem like a daunting task, but there are many ways to monetize a blog. The easiest way would be placing ads on your blog. When you start out, you'll want to become part of AdSense and place their ads on your blog. It's easy and there is no requirement on how much traffic you get. Once you do that, you'll just have to create content to bring the people! Other ways to earn money on your blog are affiliate links and sponsored posts. 2. Offer your services/ teach a skill. You probably are an expert on something. No matter how big or small your skill is, there's someone somewhere who wants to learn it. You can reach out to your friends and family to find customers by word of mouth. Another option would be to find a website like Teachable to write a course on. 3. Sell a product. Can you sew or craft? If you have any creative bone in your body, you can probably make something to sell. Check out Etsy to see what kind of things people sell these days and while you're at it, sign up for an account. Etsy makes it so easy to get your product in front of people, but don't forget about Facebook! It's the best place to sell to the people you already know. Use Etsy to reach the people you don't know yet. 4. Become a Lyft or Uber driver. Like I said, I drove for Lyft. It was great for what I needed which was to be able to make money here and there as I needed it. You have to have a car and go through a vetting process, but once you get it all set up all you have to do is turn on your app to start working. At any time you'd like. The best times to drive and make good money are at night so this is a great option for people who have obligations during the day. But driving for Lyft could also be a full time job! Need more money? Spend more time driving- it's as easy as that. 5. Walk dogs on Wag. If you are a dog lover, you can earn extra money by becoming a dog walker! This service is a lot like Lyft or Uber except it's for dogs. You have to know a little about dogs and working with them, but as long as you do, you can make money hanging out with furry friends. This service also has options for recurring dog walks, so you may even be able to have steady income through choosing that option. While you are growing your blog, you may need to use some of these resources to supplement your cash flow and there is no shame in that! 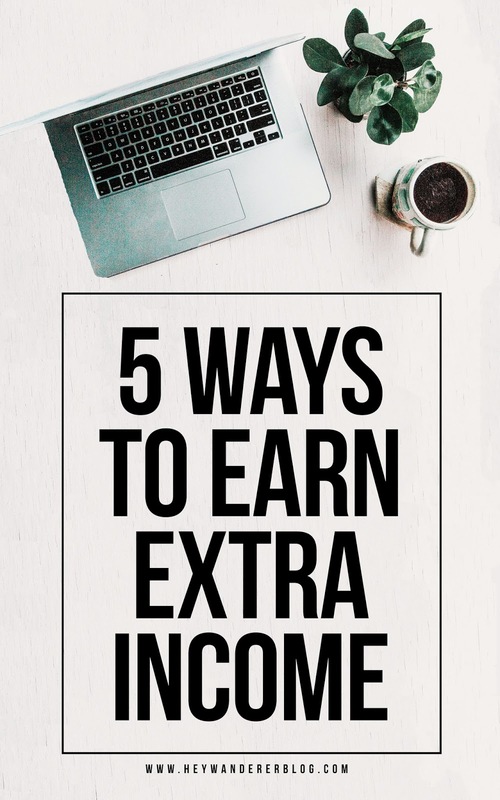 There are many other ways to make extra income- these are just a few to get started. You can make money all sorts of ways- you just have to think outside of the box. These kinds of things have been very helpful for us throughout the years while growing our blog! P.S. If you have never used Lyft before, you can use this code for $5 off your first 3 rides! That's a free $15.